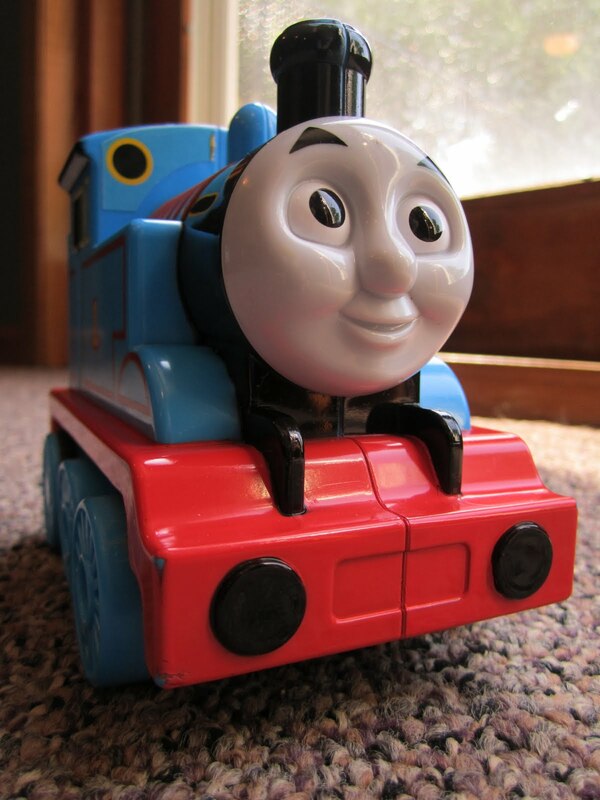 Thomas the Train has invaded our home. The show, with it's unusual script and careful pronunciation of words, has simultaneously improved Cael's vocabulary and provided him with a new collection of words and phrases to use inappropriately. Initially, I was impressed with his ability to infer the meaning of some of the words, but then others started to be taken seriously out of context. "Mommy, this pizza is really daft!" "Mommy, GO PUMP YOUR PISTONS!" EXCUSE ME?!? If he'd said it in any other context I'd be more forgiving, but these words were spoken with such hatred and wrath that his motive was clear-- my three year-old son was telling me to "go #&$% myself" without actually saying it. That move has been done before, and if he thinks he can pull the wool over my eyes, he's got another thing coming. I've seen "FRIENDS", after all. This is a hard problem to tackle, because Cael doesn't actually know any expletives (save for a two-week stretch when he was two years old and kept calling me a certain donkey-related name that he accidentally picked up from a certain relative... you know who you are!) and I don't want to introduce any truly offensive phrases in the process. "Cael, we need to talk. That's not a nice thing to say to me." "Because you said it to me in an angry way. It's not nice to yell at me like that-- it makes me think you're trying to say something even naughtier." Uh-oh. This is what I was trying to avoid. Just as I was carefully crafting a response that wouldn't require me to provide any examples, Cael came up with some of his own. "Mommy, what's naughtier than pumping my pistons? Holy cow, he's redefined the four-letter word. "Cael, those aren't naughty words, but you have to be careful not to say them in a naughty way. That hurts my feelings. Okay?" "Okay. But I wanted to watch more Thomas!" "I know, and you'll have a another chance later. What do need to you say to me?" "Cinders and ashes, Mommy. I'm sorry." So maybe Thomas isn't a good influence after all. Or maybe it doesn't matter what he watches, because I think that with the proper delivery, any phrase can be lethal. (Leave it to Cael to watch the news and tell me later that night, "I don't want to brush my teeth, Mommy. And I don't have to... this is 20/20!" I really wouldn't put it past him.) If he's already demanding I pump my pistons at age three, I'm afraid to think of what he'll say ten years from now when he's thirteen. But it's okay... I'm prepared. "Go bust your boilers, Cael." Thanks! If you've ever seen "Thomas the Train", I think you can relate!